"The science of aviation through the art of flying." Brill Aerosports is Northern Nevada's premiere flight school, with programs designed to provide pilots with critical technical training, as well as the chance to experience flight as they have never before. We believe that flying should always be fun, and by learning such important skills as how to recover from unusual flight attitudes, a pilot can truly discover and enjoy the art of flying. Whether you're a beginner looking to get some hours under your belt or an experienced pilot wishing to sharpen your skills and have some fun in the process, Brill Aerosports is your first step toward achieving your goals. 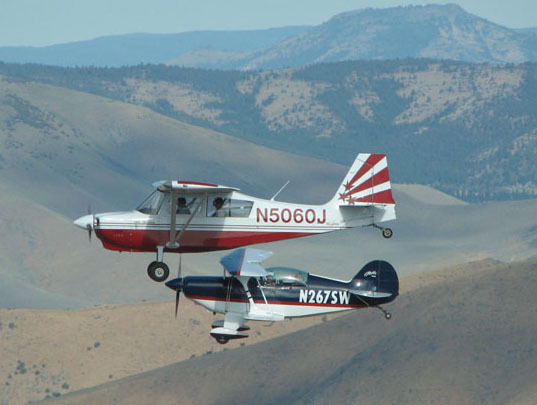 As a family-owned and operated flight school based out of the Reno Stead Airport (RTS), our no-nonsense approach to instruction stems from our belief that the best way to fly is to have fun and be prepared. Our four specialty programs are structured for pilots of all skill levels, and intended to provide a well-rounded overview of the potentially life-saving technical skills every pilot should have. These courses include our: Emergency Maneuver Training Course, our Tailwheel Endorsement, our Advanced Spins (Spin Endorsement) our Basic Aerobatics Course and Intermediate Aerobatics Course. We also provide Flight Reviews, On Site Clinics, CFI Refresher Clinics, Expert Witness , our 26-hour Aviation Survival Course and ongoing Aviation Seminars. Don't forget about our Air Shows ! With an undeniable passion for flying, Tim's instruction style echoes his no-nonsense approach to flying: always fun and always informative. Having honed his flying skills in Alaska Tim specializes in tailwheel endorsements, emergency maneuver training, spin training, aerobatics and mountain flying, and with over 6,600 hours of instructional experience in tailwheel airplanes, Tim encourages students to always strive for higher than what is required of them. An ATP, CFI and CFII, Tim is A Master Certificated Flight Instructor - Aerobatic (MCFI - A), a member of IAC (the International Aerobatic Club. Tim is the past President of IAC Chapter 118, a National Judge, holder of the IAC "All Five" patch plus a few "Stars" patches, and the current IAC Safety Chairman), CUATE (Council on Unusual Attitude Training & Education), SAFE (Society of Aviation and Flight Educators), EAA (Experimental Aircraft Association. Tim is an EAA Flight Advisor), AOPA (Aircraft Owners and Pilots Association), and a FAA Safety Team Representative for the FAA WP-11 district. Tim Brill was also selected as the 2013 Western-Pacific Region CFI of the Year! Matt began flying gliders at age 14. Now at the ripe old age of 29, he holds his CFI, Commercial Pilot Certificate, Airplane Single Engine, Glider and Instrument ratings, and is closing in on two thousand five hundred hours of flight time, and his ATP certification! He is also a seasoned aerobatic competitor and is looking forward to progressing through the ranks of the IAC. He recently received the All Five Power Achievement Award! The United States is one of the very few countries whose national aviation agency (our FAA) does not issue an aerobatic instructor certificate. In some countries you will even find a spin instructor certificate. So, although all cfi’s certificated in the USA are exceptional, they may not have the experience you deserve while learning aerobatics. Aerobatic Instructors are true specialists. So, how do you decide. Word of mouth is a great start. So too is some of the non-governmental entities, like Master Instructors, LLC (http://www.masterinstructors.org/), they issue a Master Certificated Flight Instructor - Aerobatic (MCFI-A) accreditation. Also good is the International Aerobatic Club (www.IAC.org). IAC lists aerobatic flight schools and you can check to see if your instructor has participated in the aerobatic achievement awards program and/or is an aerobatic judge. Finally, there is the International Council of Air Shows (https://www.airshows.aero/). The ICAS ACE evaluation program is second to none. Also, what airplane will you be using and is there a FAA recognized practice area? So, just because your potential cfi happens to have an aerobatic airplane, ask a lot more questions. The Science of Aviation through the Art of Flight.